When Windows Phone launched a year ago, we were excited to first see it on the Super AMOLED screen of the Samsung Omnia 7. 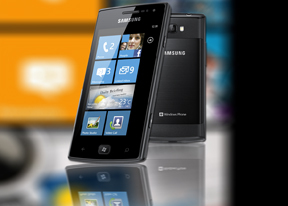 Twelve months or so later, Samsung are sort of in power-saving mode in the joint venture with Microsoft. Their Omnia W isn’t drawing all attention to itself by blowing the numbers out of proportion. The Omnia W has shed weight and lost some of its predecessor’s screen estate. What you get in return is an upgraded processor and double the data speeds. The display technology, camera sensor and the general feel haven't changed much. Well, yes, some would call it a half-hearted effort. Or maybe, Samsung are simply waiting for the dust to settle from Nokia’s grand entry into Windows Phone. Obviously, they didn’t want – or need – a European flagship along the lines of their US-based Focus S with AT&T. With a single Windows-phone handset on the Old Continent, it may’ve made sense to focus on the midrange instead of making another flagship without a fleet. Bottom line, as long as we remember that it’s not an upgrade of the original Omnia 7, the Omnia W is an easy phone to live with, for all its strengths and shortcomings. The Omnia W should ring a bell to those of you who keep an eye on the US phone market. We recently reviewed the Samsung Focus Flash, which is virtually the same package, exclusive to AT&T. We liked the well-built, properly powered and reasonably priced Focus Flash and we guess the Omnia W can count on a warm welcome too by users who don’t want to spend over the odds on a decent smartphone. People who are willing to consider Windows Phone should be well familiar by now with the platform’s limitations. The Omnia W shares the same disadvantages as its main competitors but tries to at least partially make up for them with premium build and some custom additions to what’s otherwise a standard package. Some may be quick to slam the Samsung Omnia W over its seeming lack of innovation. There’s little really to set it apart from the year-old Omnia 7. The smaller display looks puzzling perhaps against Android’s march towards bigger and bigger screens – for which Samsung are in no small part responsible. We'll say it again though - the Omnia W is not for upgraders to consider. It’s called upon to carve a new niche for Samsung in the midrange. How successful it will be depends on the competition too. For the time being, it’s the HTC Radar and the Nokia Lumia 800 that the Omnia W will have to face. The midrange is a relatively new territory for Windows Phone and it’s getting busier as we speak. Stay with us as we try to find out if the Omnia W has what it takes to make it.